Keep your business separate from your personal spending. Open a Business Membership Account with UKRFCU to make things easier for when tax season comes. Business Accounts can open: Prime Shares, Share Drafts, Money Markets, and Share Certificates. *To open a Business Account, you must qualify for a General Membership. 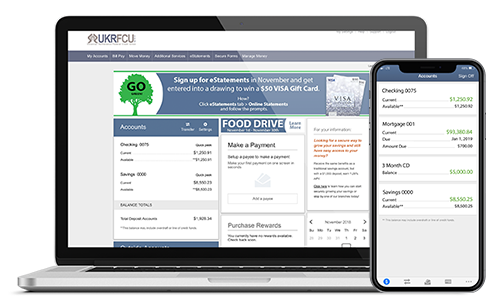 UKRFCU offers the opportunity for churches and community-based organizations to open accounts with similar features and services as our general memberships.These include: Prime Shares, Share Drafts, Money Markets, and Share Certificates. *Authorized signers on account do not have to be members of UKRFCU. Freedom to pay your bills from wherever and whenever. Every transaction is automatically categorized, so that you can start saving smarter. Go paperless for faster and safer access to your records. Tap. Snap. Deposit. Deposit checks remotely from your mobile device. In order to open a Business or Organization account, you must be a member of UKRFCU. To learn more about our general membership and eligibility requirements, click below. What types of business partnerships can open a Business Account and what documents are required? Sole Proprietorship– Requests a copy of the Trade Name/Assumed Business Name registration. Corporation– Request the Articles of Incorporation. Limited Liability Company (LLC)– Request the Articles of Organization. Partnership/Limited Liability Partnerships (LLP) – Request a copy of the Partnership Agreement. Do authorized signers on the Business Account have to be members? All authorized signers on the Business Account must be primary members of UKRFCU. Do authorized signers on an Organizational Account have to be members? Authorized signers for an Organization Account are NOT required to be primary members of UKRFCU.